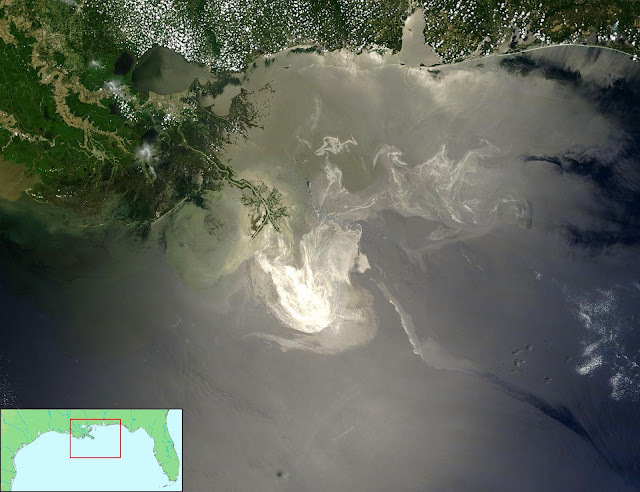 In the days following the 2010 Deepwater Horizon oil spill, methane-eating bacteria bloomed in the Gulf of Mexico, feasting on the methane that gushed, along with oil, from the damaged well. The sudden influx of microbes was a scientific curiosity: Prior to the oil spill, scientists had observed relatively few signs of methane-eating microbes in the area. Now researchers at MIT have discovered a bacterial gene that may explain this sudden influx of methane-eating bacteria. This gene enables bacteria to survive in extreme, oxygen-depleted environments, lying dormant until food — such as methane from an oil spill, and the oxygen needed to metabolize it — become available. The gene codes for a protein, named HpnR, that is responsible for producing bacterial lipids known as 3-methylhopanoids. The researchers say producing these lipids may better prepare nutrient-starved microbes to make a sudden appearance in nature when conditions are favorable, such as after the Deepwater Horizon accident. The lipid produced by the HpnR protein may also be used as a biomarker, or a signature in rock layers, to identify dramatic changes in oxygen levels over the course of geologic history. Welander and Roger Summons, a professor of Earth, atmospheric and planetary sciences, have published their results this week in the Proceedings of the National Academy of Sciences. Earth’s rocky layers hold remnants of life’s evolution, from the very ancient traces of single-celled organisms to the recent fossils of vertebrates. One of the key biomarkers geologists have used to identify the earliest forms of life is a class of lipids called hopanoids, whose sturdy molecular structure has preserved them in sediment for billions of years. Hopanoids have also been identified in modern bacteria, and geologists studying the lipids in ancient rocks have used them as signs of the presence of similar bacteria billions of years ago. But Welander says hopanoids may be used to identify more than early life forms: The molecular fossils may be biomarkers for environmental phenomena — such as, for instance, periods of very low oxygen. To test her theory, Welander examined a modern strain of bacteria called Methylococcus capsulatus, a widely studied organism first isolated from an ancient Roman bathhouse in Bath, England. The organism, which also lives in oxygen-poor environments such as deep-sea vents and mud volcanoes, has been of interest to scientists for its ability to efficiently consume large quantities of methane — which could make it helpful in bioremediation and biofuel development. For Welander and Summons, M. capsulatus is especially interesting for its structure: The organism contains a type of hopanoid with a five-ring molecular structure that contains a C-3 methylation. Geologists have found that such methylations in the ring structure are particularly well-preserved in ancient rocks, even when the rest of the organism has since disappeared. Welander pored over the bacteria’s genome and identified hpnR, the gene that codes for the protein HpnR, which is specifically associated with C-3 methylation. She devised a method to delete the gene, creating a mutant strain. Welander and Summons then grew cultures of this mutant strain, as well as cultures of wild, unaltered bacteria. The team exposed both strains to low levels of oxygen and high levels of methane over a two-week period to simulate an oxygen-poor environment. During the first week, there was little difference between the two groups, both of which consumed methane and grew at about the same rate. However, on day 14, the researchers observed the wild strain begin to outgrow the mutant bacteria. When Welander added the hpnR gene back into the mutant bacteria, she found they eventually bounced back to levels that matched the wild strain. What might explain the dramatic contrast in survival rates? To answer this, the team used electron microscopy to examine the cellular structures in both mutant and wild bacteria. They discovered a stark difference: While the wild type was filled with normal membranes and vacuoles, the mutant strain had none. The missing membranes, Welander says, are a clue to the lipid’s function. She and Summons posit that the hpnR gene may preserve bacteria’s cell membranes, which may reinforce the microbe in times of depleted nutrients. The results, Welander says, are especially exciting from a geological perspective. If 3-methylhopanoids do indeed allow bacteria to survive in times of low oxygen, then a spike of the related lipid in the rock record could indicate a dramatic decrease in oxygen in Earth’s history, enabling geologists to better understand periods of mass extinctions or large ocean die-offs. This research was supported by NASA and the National Science Foundation. American Chemical Society (ACS) Awards Priestley Medal To Peter J. Stang, Ph.D.